2-1, USA, with more for the coaches to think about. This past Saturday, the team took on Nigeria, who will also be in Brazil and are easily the best opponent of the three. This 2-1 win was pretty convincing, and should have us all feeling a lot more positive. The defense looked stout, the attacking movements were there, and Jozy Altidore scored twice to break out of his slump. If you had asked what we wanted out of the Nigeria game, those preceding three points are it. Illinois basketball opened the season this weekend with a pair of wins over Alabama State (80-63) and Jacksonville State (86-62). Both opponents were small conference foes who were never going to be competitive unless they shot lights out from three-land. You can only take away so much from these types of games; but you better believe John Groce and company saw plenty. And the coaching staff has the definite objective of blooding the five freshmen, building the depth and confidence, and getting prepared for the foul-out slugfests to come next month and in conference play. We mention the foul-outs due to the new points of emphasis the NCAA has implemented to cut down hand-checking, bumping, and Duke-style phantom charges. That sound you hear is Matt Painter grinding his teeth at Purdue. We’re mostly in favor of this, but man are we going to see some ugly games until the players and coaches adjust. 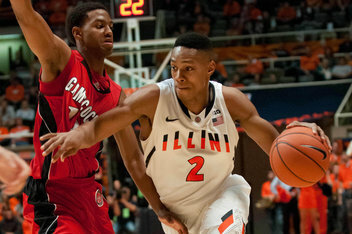 The Illini return just three contributors from last season: Nnanna Egwu, Joe Bertrand, and Tracy Abrams. As has been highlighted elsewhere, the rest are transfers and freshmen. We don’t really know the identity of this team – who will take the clutch shots or grab the vital rebounds. We do know Coach Groce will have them playing hard and attacking the basket. How many wins can this group gather; how will they sack up against top opponents? It’ a big question mark. We’re hoping for post-season play (translate NIT) with a chance to sneak into the NCAA Tourney. The CONCACAF Gold Cup has begun, with a couple of surprises – including Mexico’s opening match defeat to Panama. For us it really gets started tonight as the USA takes on Belize in Portland (10:00 CST, Fox Soccer). Only in CONCACAF does the regional championship routinely feature ‘B’-level squads from its top two teams, yet those teams (USA and Mexico) still expect to win. This year’s Gold Cup is a little different, though. This year’s winner will square off against the 2015 winner for the right to go to the 2017 Confederations Cup in Russia (the World Cup Warm-up event that just finished in Brazil). So the Gold Cup does matter this time. The tourney is also a nice way for the CONCACAF bureaucrats to make some money, get their teams on TV, and get some of the smaller teams more competitive. Bonus points if you can guess the number of Cubans who end up defecting, and the number of unknown MLS signees-of-the-future to be seen in this Gold Cup. US Soccer can see Brazil on the horizon. Thanks to two wins in the last week, last Friday’s 2-1 victory in Jamaica and Tuesday night’s 2-0 defeat of Panama in Seattle, Jurgen Klinsmann and co. are top of the Hex in World Cup Qualifying. The team has 10 points from five games over this first stretch that included three road games. 16 points has guaranteed qualification in past cycles, and with a majority of home games remaining, a win next Tues. over Honduras and the team can shift emphasis a bit. It will be more about building the team and less worrying about getting to Brazil next summer. The team also looks much, much better. A number of factors contribute here: time together, diminished quality of opponents, and a likely change in some coaching/communication methods. The key component has been the emergence of important utility players, who have stepped into new or less familiar roles. This can be a tricky proposition; oftentimes when you play guys outside their natural or familiar club position, they’re tentative or ineffective. But Jurgen seems to have pushed the right buttons in this case, and his plug-and-play lineups have succeeded – at least against these regional opponents.